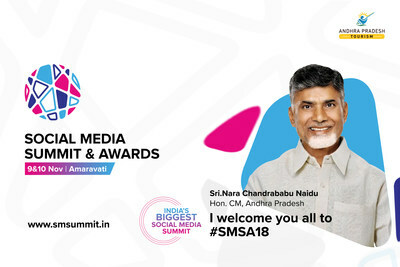 The second edition of the Social Media Summit and Awards 2018 is here and this time, the focus is to envision the vital role of social media in the day-to-day life and the change it might bring to respect the information, governance, business, and commerce. This time, the event will recreate the use-case of the technology behind the industry and connect with top-notch social media companies and thought-leaders to collaborate and raise conversations about the future of increasing products and services based on social media. Vision: Leveraging Social Media and digital networks by extending conversations around Social Media. A complete Summit, Social Media Expo, Awards Nights are the three important parts of the event. The summit will be hosting over 1,000+ delegates from diverse backgrounds and fields, 350+ prominent social media influencers from around the nation and 40+ renowned speakers. The summit will commence at 11 AM and conclude at 7 PM followed by Networking Dinner. Social Media Awards is a grand-gala red-carpet night honouring individuals, teams and celebrities who use social media as a platform, avidly. SMSA targets to encourage extensive development while exhibiting the growing prospects that evolve around and emerge from social media. The event will witness special invitees, social media fraternities, nominees for Social Media Awards and public who will witness performances from all over India and the biggest celebration in the history of Social Media. The Awards Night will start at 5:30 PM and will have over 40 Social Influencers and content creators across platforms being awarded for their work on Social Media. The event will generate over 100 million cumulative reach on social media through the award winning social influencers across platforms. This Summit is being taken forward as part of the Vision of Mr. Chandrababu Naidu, the Chief Minister of Andhra Pradesh. Hence the event is powered by the Government of Andhra Pradesh and AP Tourism. Social Media Summit & Awards is Conceptualised and Produced by VIBRI MEDIA. SMSA is a massive national movement started in 2017 connecting people, content creators and conversations around emerging trends in media, importantly social media which is now one of world's biggest medium to communicate, promote and develop individually as a community. For more information, visit: https://www.smsummit.in/ . CEO, Startup Oxide Biz Sol Pvt. Ltd.